Rheumatoid Arthritis Rheumatoid arthritis (RA) is a chronic inflammatory condition. (第三期)類風濕性關節炎造成的腳部變形. 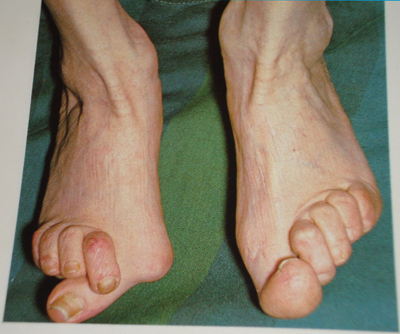 Third stage of rheumatoid arthritis of feet. 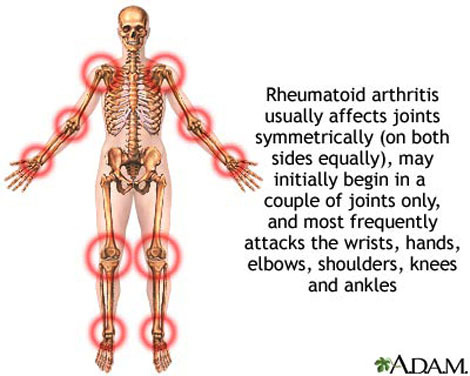 Rheumatoid arthritis (RA) is an autoimmune disease that results in a chronic, systemic inflammatory disorder that may affect many tissues and organs, but principally attacks flexible (synovial) joints. It can be a disabling and painful condition, which can lead to substantial loss of functioning and mobility if not adequately treated. The process involves an inflammatory response of the capsule around the joints (synovium) secondary to swelling (turgescence) of synovial cells, excess synovial fluid, and the development of fibrous tissue (pannus) in the synovium. The pathology of the disease process often leads to the destruction of articular cartilage and ankylosis (fusion) of the joints. RA can also produce diffuse inflammation in the lungs, the membrane around the heart (pericardium), the membranes of the lung (pleura), and white of the eye (sclera), and also nodular lesions, most common in subcutaneous tissue. Although the cause of RA is unknown, autoimmunity plays a big part, and RA is a systemic autoimmune disease. It is a clinical diagnosis made on the basis of symptoms, physical exam, radiographs (X-rays) and labs. Treatments are pharmacological and non-pharmacological. Non-pharmacological treatment includes physical therapy, orthoses, occupational therapy and nutritional therapy but these don't stop the progression of joint destruction. Analgesia (painkillers) and anti-inflammatory drugs, including steroids, suppress symptoms, but don't stop the progression of joint destruction either. Disease-modifying antirheumatic drugs (DMARDs) slow or halt the progress of the disease. The newer biologics are DMARDs. The evidence for complementary and alternative medicine (CAM) treatments for RA related pain is weak, with the lack of high quality evidence leading to the conclusions that their use is currently not supported by the evidence nor proved to be of benefit. About 0.6% of the United States adult population has RA, women two to three times as often as men. Onset is most frequent during middle age, but people of any age can be affected. The name is based on the term "rheumatic fever", an illness which includes joint pain and is derived from the Greek word rheuma (nom. ), rheumatos (gen.) ("flow, current"). The suffix -oid ("resembling") gives the translation as joint inflammation that resembles rheumatic fever. The first recognized description of RA was made in 1800 by Dr. Augustin Jacob Landré-Beauvais (1772–1840) of Paris. Half of the risk for RA is believed to be genetic. It is strongly associated with the inherited tissue type major histocompatibility complex (MHC) antigen HLA-DR4 (most specifically DR0401 and 0404), and the genes PTPN22 and PADI4 - -hence family history is an important risk factor. Inheriting the PTPN22 gene has been shown to double a person's susceptibility to RA. PADI4 has been identified as a major risk factor in people of Asian descent, but not in those of European descent. First-degree relatives prevalence rate is 2–3% and disease genetic concordance in monozygotic twins is approximately 15–20%. Smoking is the most significant non-genetic risk with RA being up to three times more common in smokers than non-smokers, particularly in men, heavy smokers, and those who are rheumatoid factor positive. Modest alcohol consumption may be protective. Epidemiological studies have confirmed a potential association between RA and two herpesvirus infections:Epstein-Barr virus (EBV) and Human Herpes Virus 6 (HHV-6). Individuals with RA are more likely to exhibit an abnormal immune response to EBV and have high levels of anti-EBV antibodies. Vitamin D deficiency is common in those with RA and may be causally associated. Some trials have found a decreased risk for RA with vitamin D supplementation while others have not. 1. A genetic link with HLA-DR4 and related allotypes of MHC Class II and the T cell-associated protein PTPN22. 2. 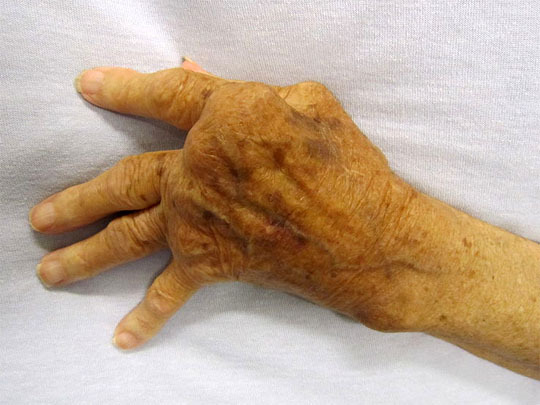 An undeniable link to the pathogenesis of vascular disease of many types, including the possibility of a strong causal connection to rheumatoid vasculitis, a typical feature of this condition. 3. A remarkable deceleration of disease progression in many cases by blockade of the cytokine TNF (alpha). 4. A similar dramatic response in many cases to depletion of B lymphocytes, but no comparable response to depletion of T lymphocytes. 5. A more or less random pattern of whether and when predisposed individuals are affected. 6. The presence of autoantibodies to IgGFc, known as rheumatoid factors (RF), and antibodies to citrullinated peptides (ACPA). If TNF release is stimulated by B cell products in the form of RF or ACPA-containing immune complexes, through activation of immunoglobulin Fc receptors, then RA can be seen as a form of Type III hypersensitivity. If TNF release is stimulated by T cell products such as interleukin-17 it might be considered closer to type IV hypersensitivity although this terminology may be getting somewhat dated and unhelpful. The debate on the relative roles of immune complexes and T cell products in inflammation in RA has continued for 30 years. There is little doubt that both B and T cells are essential to the disease. However, there is good evidence for neither cell being necessary at the site of inflammation. This tends to favour immune complexes (based on antibody synthesised elsewhere) as the initiators, even if not the sole perpetuators of inflammation. Moreover, work by Thurlings and others in Paul-Peter Tak's group and also by Arthur Kavanagh's group suggest that if any immune cells are relevant locally they are the plasma cells, which derive from B cells and produce in bulk the antibodies selected at the B cell stage. Although TNF appears to be the dominant, other cytokines (chemical mediators) are likely to be involved in inflammation in RA. Blockade of TNF does not benefit all patients or all tissues (lung disease and nodules may get worse). Blockade of IL-1, IL-15 and IL-6 also have beneficial effects and IL-17 may be important. Constitutional symptoms such as fever, malaise, loss of appetite and weight loss are also caused by cytokines released into the blood stream. As with most autoimmune diseases, it is important to distinguish between the cause(s) that trigger the process, and those that may permit it to persist and progress. The factors that allow an abnormal immune response, once initiated, to become permanent and chronic, are becoming more clearly understood. The genetic association with HLA-DR4, as well as the newly discovered associations with the gene PTPN22 and with two additional genes, all implicate altered thresholds in regulation of the adaptive immune response. It has also become clear from recent studies that these genetic factors may interact with the most clearly defined environmental risk factor for RA, namely cigarette smoking. Other environmental factors also appear to modulate the risk of acquiring RA, and hormonal factors in the individual may explain some features of the disease, such as the higher occurrence in women, the not-infrequent onset after child-birth, and the (slight) modulation of disease risk by hormonal medications. Exactly how altered regulatory thresholds allow the triggering of a specific autoimmune response remains uncertain. However, one possibility is that negative feedback mechanisms that normally maintain tolerance of self are overtaken by aberrant positive feedback mechanisms for certain antigens such as IgG Fc (bound by RF) and citrullinated fibrinogen (bound by ACPA). Once the abnormal immune response has become established (which may take several years before any symptoms occur), plasma cells derived from B lymphocytes produce rheumatoid factors and ACPA of the IgG and IgM classes in large quantities. These are not deposited in the way that they are in systemic lupus. Rather, they activate macrophages through Fc receptor and complement binding, which seems to play an important role in the intense inflammatory response present in RA. This contributes to inflammation of the synovium, in terms of edema, vasodilation and infiltration by activated T-cells (mainly CD4 in nodular aggregates and CD8 in diffuse infiltrates). Synovial macrophages and dendritic cells further function as antigen presenting cells by expressing MHC class II molecules, leading to an established local immune reaction in the tissue. The disease progresses in concert with formation of granulation tissue at the edges of the synovial lining (pannus) with extensive angiogenesis and production of enzymes that cause tissue damage. Modern pharmacological treatments of RA target these mediators. Once the inflammatory reaction is established, the synovium thickens, the cartilage and the underlying bone begins to disintegrate and evidence of joint destruction accrues. planes shows both signs of destruction and inflammation. Axial T1-weighted magnetic resonance images were obtained (c) before and (d) after contrast administration, also demonstrating synovitis. Additionally, a coronal T1-weighted magnetic resonance image (e) before contrast administration visualizes the same bone erosion as shown in panels c and d. X-rays of the hands and feet are generally performed in people with a polyarthritis. In RA, there may be no changes in the early stages of the disease, or the x-ray may demonstrate juxta-articular osteopenia, soft tissue swelling and loss of joint space. As the disease advances, there may be bony erosions and subluxation. X-rays of other joints may be taken if symptoms of pain or swelling occur in those joints. signals of active synovitis depending on the degree of inflammation, are useful in assessing synovial inflammation. This is important, since in the early stages of RA, the synovium is primarily affected, and synovitis seems to be the best predictive marker of future joint damage . 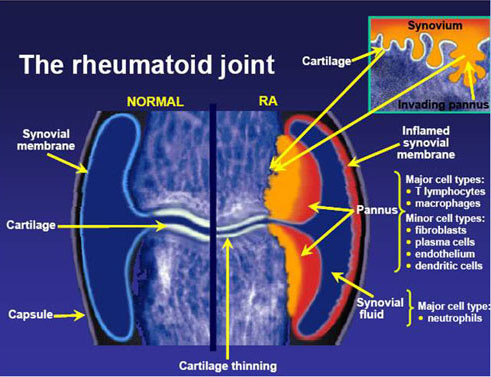 When RA is clinically suspected, immunological studies are required, such as testing for the presence of rheumatoid factor (RF, a non-specific antibody). A negative RF does not rule out RA; rather, the arthritis is called seronegative. This is the case in about 15% of patients. During the first year of illness, rheumatoid factor is more likely to be negative with some individuals converting to seropositive status over time. RF is also seen in other illnesses, for example Sjögren's syndrome, Hepatitis C, chronic infections and in approximately 10% of the healthy population, therefore the test is not very specific. Because of this low specificity, new serological tests have been developed, which test for the presence of the anti-citrullinated protein antibodies (ACPAs) or anti-CCP. Like RF, these tests are positive in only a proportion (67%) of all RA cases, but are rarely positive if RA is not present, giving it a specificity of around 95%. As with RF, there is evidence for ACPAs being present in many cases even before onset of clinical disease. for diagnosis of RA and shows a sensitivity of 72% and specificity of 99.7%. Also, several other blood tests are usually done to allow for other causes of arthritis, such as lupus erythematosus. The erythrocyte sedimentation rate (ESR), C-reactive protein, full blood count, renal function, liver enzymes and other immunological tests (eg , antinuclear antibody / ANA) are all performed at this stage. Elevated ferritin levels can reveal hemochromatosis, a mimic of RA, or be a sign of Still's disease, a seronegative, usually juvenile, variant of rheumatoid arthritis. The new criteria accommodate to the growing understanding of RA and the improvements in diagnosing RA and disease treatment. In the "new" criteria serology and autoimmune diagnostics carries major weight, as ACPA detection is appropriate to diagnose the disease in an early state, before joints destructions occur. Destruction of the joints viewed in radiological images was a significant point of the ACR criteria from 1987. This criterion no longer is regarded to be relevant, as this is just the type of damage that treatment is meant to avoid. ● the detection of rheumatoid factors or autoantibodies against ACPA such as autoantibodies to mutated citrullinated vimentin can confirm the suspicion of RA. A negative autoantibody result does not exclude a diagnosis of RA. ● Crystal induced arthritis (gout, and pseudogout) - usually involves particular joints (knee, MTP1, heels) and can be distinguished with aspiration of joint fluid if in doubt. Redness, asymmetric distribution of affected joints, pain occurs at night and the starting pain is less than an hour withgout. ● Osteoarthritis - distinguished with X-rays of the affected joints and blood tests, age (mostly older patients), starting pain less than an hour, a-symmetric distribution of affected joints and pain worsens when using joint for longer periods. ● Reactive arthritis (previously Reiter's disease) - asymmetrically involves heel, sacroiliac joints, and large joints of the leg. It is usually associated with urethritis, conjunctivitis, iritis, painless buccal ulcers, and keratoderma blennorrhagica. ● Ankylosing spondylitis - this involves the spine, although a RA-like symmetrical small-joint polyarthritis may occur in the context of this condition. ● Sarcoidosis, amyloidosis, and Whipple's disease can also resemble RA. ● Hemochromatosis may cause hand joint arthritis. ● Acute rheumatic fever can be differentiated from RA by a migratory pattern of joint involvement and evidence of antecedent streptococcal infection. Bacterial arthritis (such as streptococcus) is usually asymmetric, while RA usually involves both sides of the body symmetrically. ● Gonococcal arthritis (another bacterial arthritis) is also initially migratory and can involve tendons around the wrists and ankles. The goals of treatment are to minimize symptoms such as pain and swelling, to prevent bone deformity (for example, bone erosions visible in X-rays), and to maintain day-to-day functioning. This can often be achieved using two main classes of medications: analgesics such as NSAIDs, and disease-modifying antirheumatic drugs (DMARDs). RA should generally be treated with at least one specific anti-rheumatic medication. The use of benzodiazepines (such as diazepam) to treat the pain is not recommended as it does not appear to help and is associated with risks. Analgesics, other than NSAIDs, offer lesser, but some benefit with respect to pain. Regular exercise is recommended as both safe and useful to maintain muscles strength and overall physical function. It is uncertain if specific dietary measures have an effect. Disease-modifying antirheumatic drugs (DMARD) are the primary treatment for RA. They are a diverse collection of drugs, grouped by use and convention. They have been found to improve symptoms, decrease joint damage, and improve overall functional abilities. They should be started very early in the disease as when they result in disease remission in approximately half of people and improved outcomes overall. The most commonly used agent is methotrexate with other frequently used agents including sulfasalazine and leflunomide. Sodium aurothiomalate (Gold) and cyclosporin are less commonly used due to more common adverse effects. Agents may be used in combinations. 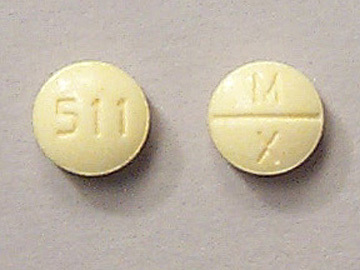 Methotrexate is the most important and useful DMARD and is usually the first treatment. Adverse effects should be monitored regularly with toxicity including gastrointestinal, hematologic, pulmonary, and hepatic. The most common undesirable affect is that it increases liver enzymes in almost 15% of people. It is thus recommended that those who consistently demonstrate abnormal levels of liver enzymes or have a history of liver disease or alcohol use undergo liver biopsies. 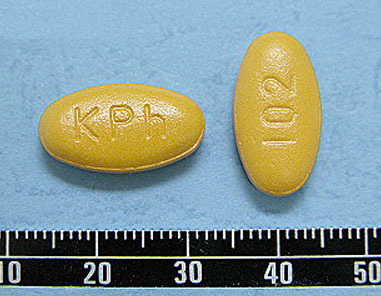 Methotrexate is also considered a teratogenic and as such, it is recommended women of childbearing age should use contraceptives to avoid pregnancy and to discontinue its use if pregnancy is planned. Biological agents should generally only be used if methotrexate and other conventional agents are not effective after a trial of three months. 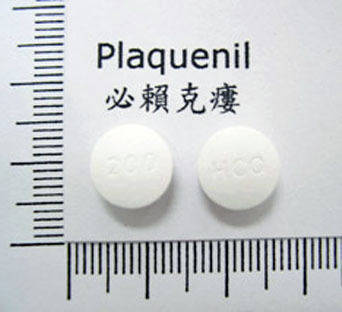 These agents include: tumor necrosis factor alpha (TNFα) blockers such as infliximab; interleukin 1 blockers such as anakinra, monoclonal antibodies against B cells such as rituximab, T cell costimulation blocker such as abatacept among others. They are often used in combination with either methotrexate or leflunomide. TNF blockers and methotrexate appear to have similar effectiveness when used alone and better results are obtained when used together. TNF blockers appear to have equivalent effectiveness with etanercept appearing to be the safest. Abatacept appears effective for RA with 20% more people improving with treatment than without. There however is a lack of evidence to distinguish between the biologics available for RA. Issues with the biologics include their high cost and association with infections including tuberculosis. first line agents. NSAIDs should be used with caution in those with gastrointestinal, cardiovascular, or kidney problems. COX-2 inhibitors, such as celecoxib, and NSAIDs are equally effective. They have a similar gastrointestinal risk as an NSAIDs plus a proton pump inhibitor. In the elderly there is less gastrointestinal intolerance to celecoxib than to NSAIDs alone. There however is an increased risk of myocardial infarction with COX-2 inhibitors. Anti-ulcer medications are not recommended routinely but only in those high risk of gastrointestinal problems. Glucocorticoids can be used in the short term for flare-ups, while waiting for slow-onset drugs to take effect. Injection of glucocorticoids into individual joints is also effective. While long-term use reduces joint damage it also results in osteoporosis and susceptibility to infections, and thus is not recommended. In early phases of the disease, an arthroscopic or open synovectomy may be performed. It consists of the removal of the inflamed synovia and prevents a quick destruction of the affected joints. Severely affected joints may require joint replacement surgery, such as knee replacement. Postoperatively, physiotherapy is always necessary. controlled trials (RCTs), making definitive conclusions difficult to reach. evidence to draw conclusions." A systematic review of CAM modalities (excluding fish oil) found "The major limitation in reviewing the evidence for CAMs is the paucity of RCTs in the area. The available evidence does not support their current use in the management of RA." One review suggests that of the various alternative medicine treatments evaluated, only acupuncture, bee venom acupuncture, herbal remedies, dietary omega-3 fatty acids, and pulsed electromagnetic field therapy have been studied with RCTs and show promise in treating the pain of RA, though no definitive conclusions could be reached. reduce pain, tender joint count and stiffness, is generally safe. The following show promise as treatments for RA, based on preliminary studies: boswellic acid, curcumin, Devil's claw, Euonymus alatus, and Thunder god vine (Tripterygium wilfordii). herb thunder god vine (Tripterygium wilfordii) can have serious side effects."